Micromax recently launched its new smartphone to its Canvas series naming it as Micromax Canvas A94. The phone features a quad-core processor from MediaTek with 4.5 inch screen having a resolution of 480X854. The phone comes preloaded with Android Jellybean 4.2.2 OS and a 5 Megapixel camera at the back and the front also hosts a 5 Megapixel camera. Micromax Canvas A94 features a 512MB RAM which could be a disappointment for some. But the unique selling point of Micromax Canvas A94 is that you can earn money from the phone itself by viewing different types on ads. The phone contain an app called as MAd which stands as Micromax Advertising application. The MAd app for Micromax Canvas A94 is an opt-in app where users will earn points for different types of ads from various advertisers and advertising agency. As a user views ads some points are generated by the users per ad; these points then can be converted into money and users can then recharge their Micromax Canvas A94. 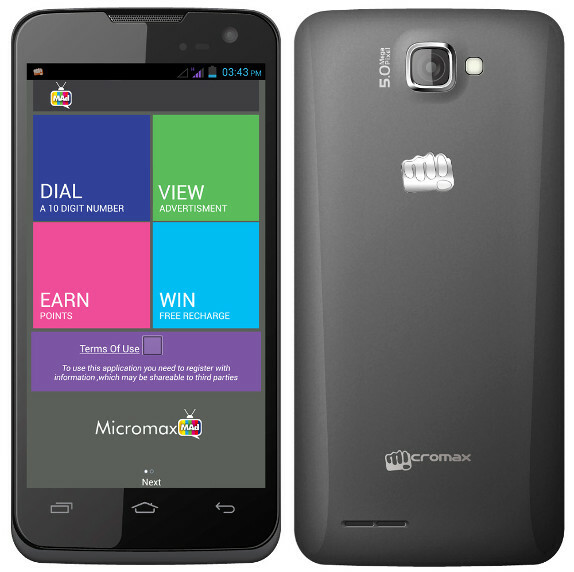 Micromax has partnered with many Telecom Operators in India to provide this service. Micromax is definitely targeting younnger audience to run it MAd campaign who are in search for different methods to make money online. Micromax Canvas A94 is available in most online store for a price of about ₹8500. But you can buy from Flipkart for a price of about ₹8199. If you’ve already bought this phone then let us know your experience of it. Have suggestions for other users then let us know in the comments section.